Frank has just sent these four pictures taken from the roof of the ablutions/dhobi block topside of the YMCA. Looking towards the Army tents and the cricket ground. Looking towards the cooks` and admin tents (mine is 4th on left)Ships are also visible out on the Great Bitter Lake. They had a rare old collection of tents then, perhaps they were left overs from WW2. 5355 and RAF Regiment tents. Ship out on the lake.Also looks like a 10 ton Hippo ? parked in the tent lines. Roman Catholic church to left with Astra cinema behind. It looks like the truck/trailer is exiting a slip road from the area topside of the tent lines. The blocks bordering the road up to the WAAF`s quarters can be seen continuing to the right beyond the gharry. The rations store with caravan office alongside. Airmens Mess as seen from the Parade Ground. The Sweetwater canal running between Kasfereet village and the camp. We drank the water from here but only after it had been treated by the camp water filtration unit. Notice however the Egyptian gent squatting by the bushes !!! Frank with the signals jeep. Hi Alwyn, the truck in the picture below is a Bedford 3 ton Water Bowser. Jack asked me about this and I hope passed the information on to you. The reason you cannot see the spare wheel is as follows.....You will not see the spare wheel behind the cab of truck , we did not used to carry them because of the local gentry pinching them also spare cans of petrol. If one got a puncture. 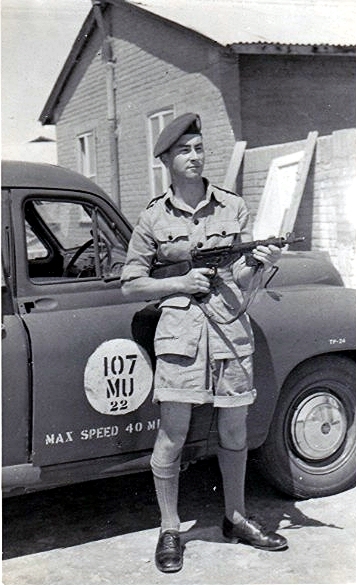 the form was drive on the flat tyre to a safe area, if off camp, and flag down anyone to get a nessage back to MT in Kasfareet for a spare to be brought out by a mechanic...I ran out of petrol once on the Treaty Road and I managed to stop one of our Bedford QL`s. The petrol filler cap of the QL was about 6 inches in diameter and I managed to use an empty Stella bottle to dip in the tank and transfer enough petrol to my tank to get back...The petrol tank on a Fordson truck was not very large and the V8 engine used a lot of petrol. 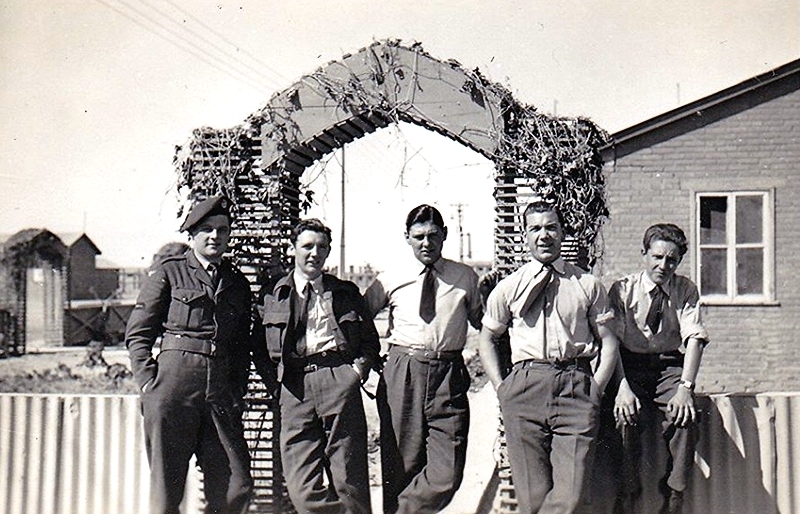 As you may know, I was Catering Accounts Ration Cpl at Kasfareet 52/53 and I have loads of photo`s of the area, some of them you already have from Jack. Before Kasfareet I spent 3 months looking after the Civilian Cantoment next to El Hamra and before that RAF Middle Wallop. Sorry that we did not have more time to talk at the re-union. Hope this helps. Alan Winspur reminded Frank that the Fire Section had a water bowser for topping up the fire engines as seen on the right of this photograph. And bods loding the empty crates the table came in for transfer to the tent lines to help turn more tents into shanty homes. Later, of course, the tents were upgraded with little brick walls and concrete bases. Frank e-mail Nov 1st 2010....Hello Alwyn, thanks again for all your work and effort.Your reference to the currant buns reminds me that you were lucky only to find weevils and not bits of "Manky" Weston. 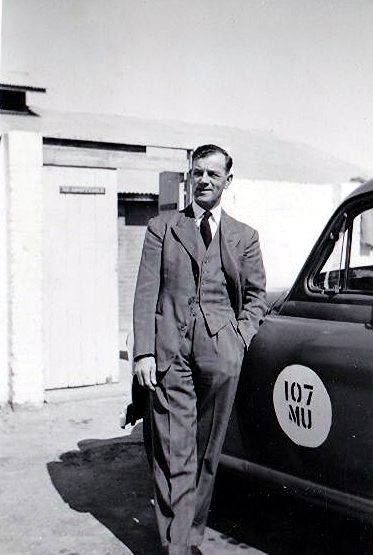 "Manky" Weston was an ex Royal Marine who had re-enlisted into the Royal Air Force as a Cook. "Manky" liked his Sherbet(Stella Beer) and consumed large quantities in the Corporal`s Club. When he was due to run early shift the following morning, he used to stagger from the club to the Cook-House and fall asleep in the large wooden Dough-Trough. His staff used to wake him with an early hot mug of shie. "Mankie" was never late for early shift. Cpl Fred Beard`s KD socks. Early one morning "Bing" Crosby, my Catering Officer, cycled down to the WRAF & Cpl`s Mess and did a spot check. He found a pair of fairly new KD socks in the Kitchen Refrigerator belonging to Cpl Fred Beard (Fred suffered with sore feet after a hard worked shift in the kitchen). Bing shot into the Catering Office Caravan and threw the socks on my desk and said that I had to charge Fred. I replied that I could`nt as Fred and I were both Corporals. Bing shouted back that I was to get Chiefy Frank Peckham. I found Chiefy who had had a bad night the previous night in the mess, with his head in his arms !!! " Tell Bing you can`t find me " he muttered. I reported back to Bing. Bing then picked up the socks and locked them in the Office safe " for evidence ", lit his pipe and sat at his desk. Abdul brought him a cup of tea and after a while he seemed back to normal. I was shortly due for demob, so I started getting my kit together to hand in. As I did`nt want to use up my clothing allowance, I remembered Fred`s socks so opened the safe and got the socks out and sent them to the dhobi. 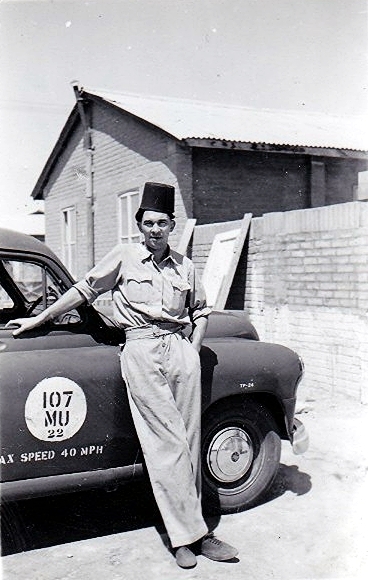 On clearing, Bing`s last words to me were " I know you have got those socks"
One of the first people I met at Lytham was Fred Beard who had left Kasfareet before me and was waiting for demob. Fred borrowed a £1 and we had a night in Blackpool together. I never got my £1 back nor did Fred get his socks !! My gharry was always difficult to start in summer mornings in the MT compound, because of the petrol evaporating in the carburettor and the petrol pump not having a hand primer. I used to get over this (if no one was looking) by use of Coke bottle of petrol dipped from a QL petrol tank. Open bonnet, slip air filter off and empty small amount of petrol ( Swayer Benzine) in top of carburettor, put hand through open windscreen and press starter. However, eventually the starter packed up and the only way to get it replaced quickly was a deal with a corporal at MTR & S....... two tins of fruit, tea and tinned milk !!! Several weeks later I had an urgent phone call from my mate at MTR & S. All had been found out by PASCO checks. There was a starter missing in a crate which should have contained complete engine and all accessories. The only way out was to have a complete engine change. This was done. Two weeks before I returned to the UK, I screwed out the restrictor screw and got 60 MPH out of my Fordson V8 down the Canal Road. The engine was fine ! This Landrover was the same one used by WingCo McClean ADMIN under Grp/Cpt Head Station C.O, while I was there. Jim McNeilly and Queen Mary we used this to collect dry rations. Outside Billet 18 with airmen`s mess to rear, Jim Mclaughlin with dog Captain. Jim lives in Northern Ireland and is very active with the history of PBY Catalina aircraft. It`s that Bantam lorry again as used in the station band tour of the camp Xmas 1952. Frank is leaning on the well.He says he often looked but never found any ackers in it !!! John McDaid MT outside Billet 18. In the background, in the cookhouse compound, can be seen the Matador Trailor which we used to collect bread and weevils from the RASC Field Bakery. It was towed by one of our Bedford QL`s and the interesting thing for the driver was that the brakes could not be connected !! A Matador had air-brakes..a Bedford didn`t !! Inside Frank Petter and Mick Perry`s tent. S.W.O. Sutherland carefully dis-entangling a shite bucket which had been hoisted to the top of the flagpole on the drill square. p.s. -Frank seems to remember that the S.W.O. was unable to get the sh**** knots undone and they had to get Groupies flag hoisted on a smaller pole and platform from up the groups ! Mike Favell says the bucket was full when hoisted up to the top !!! !